2017 saw a wave of uncertainty test structures of international peace and security—with tensions mounting on the Korean peninsula, the United States signalling its intent to withdraw from the Paris Agreement on climate change, a global treaty to ban nuclear weapons being agreed and the continuation of violent conflict throughout many regions of the world. Over the past 12 months, SIPRI remained committed to providing reliable data and independent analysis to engage researchers, policymakers, the media and the public on the path to sustainable peace. Dan Smith, SIPRI Director, attended the World Economic Forum in Davos (23–26 January) to present SIPRI's data and analysis on arms transfers and military expenditure. Smith presented interactive maps at the Global Situation Space on 'The Big Picture on Peace and Conflict' and was the keynote speaker for a panel entitled: 'Strategic Geography: Global Arms Markets', investigating what SIPRI's indicators reveal about the new balances of power and the changing character of conflict. SIPRI is proud to e-launch the Chinese-language translation of SIPRI Yearbook 2016. This translation—made possible with the generous support of the Swiss Federal Department of Defence, Civil Protection and Sport—is free to download as a PDF. SIPRI has been awarded a three-year grant from the Swedish Research Council for Sustainable Development (FORMAS). The investigation will examine the changing livelihood conditions around the Omo-Turkana Basin—a lake basin which supports over five million people. Led by SIPRI's Dr Amiera Sawas, the investigation will involve researchers from Ethiopia, Kenya, Germany, Sweden and the United Kingdom. 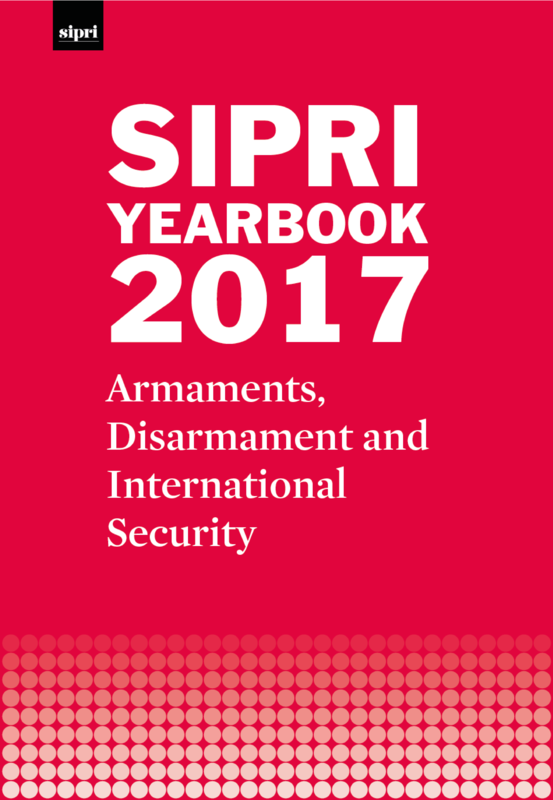 SIPRI has several mailing lists in addition to the monthly update. Choose what you receive from us by updating your preferences with the link below or at the bottom of every mailing from SIPRI. At a time when it is likely that the number and scale of natural disasters will grow, and therefore the need for humanitarian assistance is likely to increase, Dr Anastasia Aladysheva makes the case for an impact evaluation methodology in the humanitarian sphere. 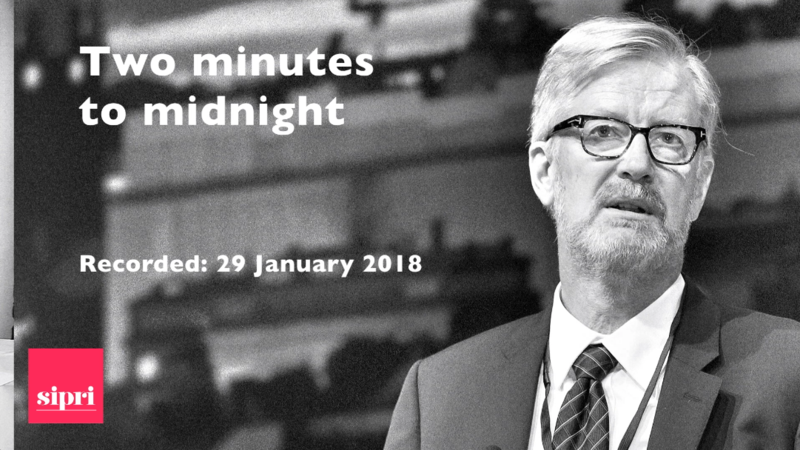 On 25 January, the Bulletin of the Atomic Scientists (BAS) pushed forward the symbolic Doomsday Clock by 30 seconds to just two minutes before midnight—the closest it has been to midnight since 1953. Dan Smith discusses this development. SIPRI and the World Food Programme will host a high-level conversation in Stockholm to investigate food security as a driver of conflict prevention and sustained peace. This will be an interactive discussion with the audience. It will be led by Dan Smith, SIPRI Director, and David Beasley, Executive Director of the United Nations World Food Programme (WFP). Register your attendance by 31 January with Alexandra Manolache, SIPRI Communications Officer (alexandra.manolache@sipri.org). This event will also be livestreamed. SIPRI will host a roundtable discussion at the 2018 Munich Security Conference (16–18 February). The Saturday lunchtime discussion will focus on the impact of emerging technology on arms control. This will involve input and engagement from Ambassador Jan Eliasson, Chair of the SIPRI Governing Board, Dan Smith, SIPRI Director, and Dr Sibylle Bauer, Director of Studies for Armament and Disarmament at SIPRI. For more information, please contact Stephanie Blenckner, Director of Communications (blenckner@sipri.org). As part of his official visit to Sweden, SIPRI hosted His Excellency, Gudlaugur Thór Thórdarson, Minister for Foreign Affairs of Iceland, for an expert roundtable discussion. Dan Smith, SIPRI Director, presided over a stimulating discussion with the minister, focusing on security challenges in the North Atlantic. The minister stressed the importance of regional cooperation, citing the Arctic Council as one example. SIPRI's workshop, entitled 'Japan-Europe-USA: Integrating cybersecurity into critical infrastructure', hosted 12 leading academic, official, legal and technical cyber experts to discuss definitions of and threats to critical infrastructure, case studies of cyber intrusion attacks, as well as concrete ways forward on national, regional and international cooperation. Climate change poses a new class of security challenges that is confronting societies worldwide. Increased risk of famine, destroyed infrastructure, houses and shelter, and violent conflict might all be consequences of climate change through gradual changes to ecosystems and extreme weather events. As a way to mitigate these challenges, states have delegated increased power to intergovernmental organizations (IGOs). This Fact Sheet summarizes the key findings of the first systematic review of research on IGOs and climate security, and the implications of existing studies for the theory and practice of global climate security governance.